Royal 1000 Count Wood Coffee Beverage Stirrers, 5.5"
Stirring cream into coffee, watching the smoky cloud brighten the dusky drink, is the beginning of good days. Spoons work well-enough, but their inadequacy lay in their efficiency. Wide and concave, a spoon swirls creamed coffee swiftly, and the morning starts too fast. Pace those first moments with Wooden Coffee Stirrers, and every moment after will be more welcome than the last. With the Wooden Coffee Stirrers, the lingering night escapes more slowly, more gently. Mornings are better begun not bounding, but with a kind crawl. The thin, flat surface slips the cream into the coffee, blending like candlelight in a dim room in May. The wooden stirrer is closer to nature than the chemical of plastic, or the harshness of steel. Friendly to the fingertips, the action of the stirrer is comfortable, an ally for meeting your hopes for good coffee and a nice day. 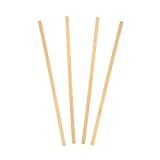 Increase the welcome of each morning by using the Wooden Coffee Stirrers. 1,000 should last a year. Make sure it is a good year.